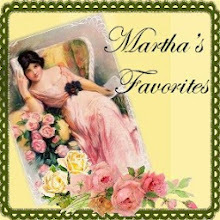 Martha of Martha's Favorites and myself. Thank you so much for coming by and also for showing us your beautiful tea cups. and it is amazing how fast the time has flown since we began. Today I am showing you my two commemorative tea cups from England. I have only just began collecting this type of cup, and I think it is going to become one of my favorite collections. I found this cup on my trip this past summer, you know, the trip I said I found 7 new tea cups! The shop I found this one in had bars on the doors and you had to knock so someone would come and let you in! It was so worth it. I found 4 of my new cups in there. The shop was piled high with all kinds of wonderful antiques and vintage items. Tea cups were stacked up on each other, tucked just about everywhere in the tiny shop. I went around at least 3 times and I still think I missed some. This is one of the cups and saucers I was really happy to find. My very first commemorative china! I really enjoy drinking tea from this cup. 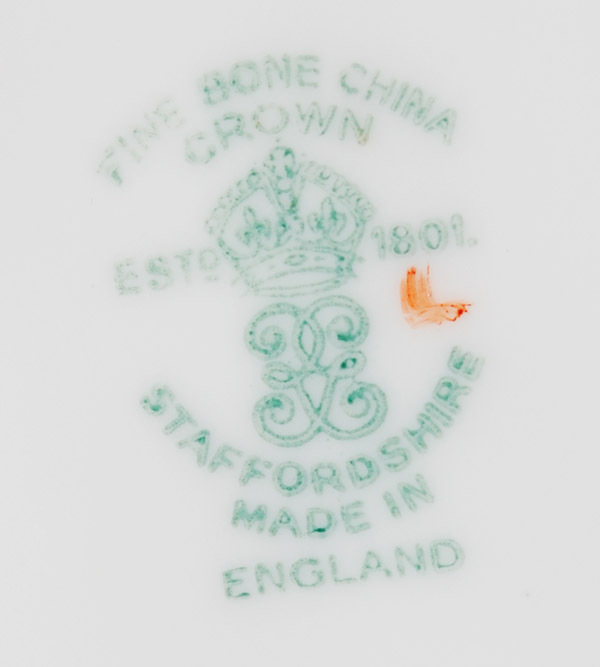 As you can see from the backstamp, it is a Tuscan cup. I did not have any luck researching on the internet for a date for this pattern. I did find that this stamp first was in use in 1947 and Queen Elizabeth's coronation (going by the plate above) was in 1953. I am pretty sure that the plate was made after her coronation! 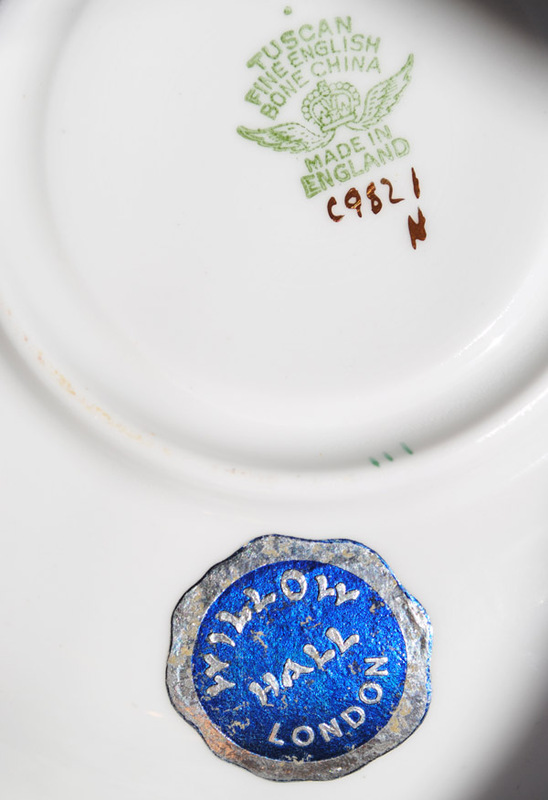 This cup and saucer are also still bearing the shops sticker that it retailed in. I found my second commemorative cup in my hometown at a local antique market. I was delighted to find it. 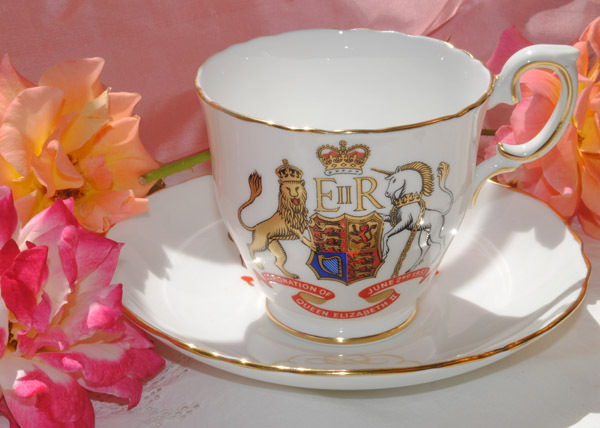 This cup also commemorates the Queen's coronation. This is the back of the cup. Does anyone know why the R is there? I know that the Queen does not have a last name. Her family changed their "last name" around 1917, because it sounded quite German (to avoid the anti German sentiment of the first World War), to Windsor (or being from the House of Windsor). This mark was used by Crown Staffordshire after the 1930s. I hope to find older commemorative china when I visit England this fall...or at least in the spring. We look forward to visiting you and seeing your tea cup today! 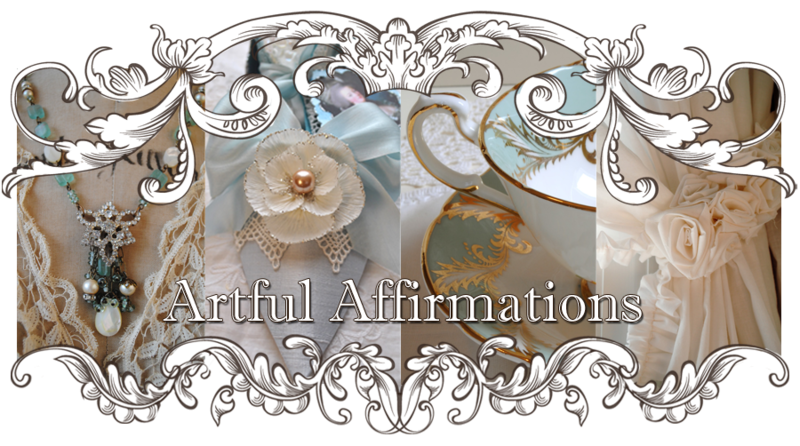 I love visiting your blog and looking at your lovely tea cups; I am a collector of tea cups as well and cannot wait until next Tuesday! What wonderful information! How could you resist that GORGEOUS cake!! So professional looking too! Can I please have your piece of cake? It looked heavenly! Thank you for sharing a lovely tea party with us today! Oh, what beautiful teacups!! I especially love the first one! Regina is Latin for "Queen"
I believe the "R" is for regina meaning reigning queen; used following a name. This is very interesting, and I did not know that about the Queen not having a last name and changing their name. It is actually educational collecting and playing teacups ~ oh, lovely teacups too. I can see why you're so excited about this new collection. Those kind of teacups are always fun to have. Going around antique store is so fun. It's like treasure hunting isn't it? LOL! Have a blessed Teacup Tuesday! Hello Terri- How fun that we have the same set. When I found my two coronation teacups I also decided to collect them. They are a piece of history. Take care. Terri dear, now you made my heart beat skips many many beats! 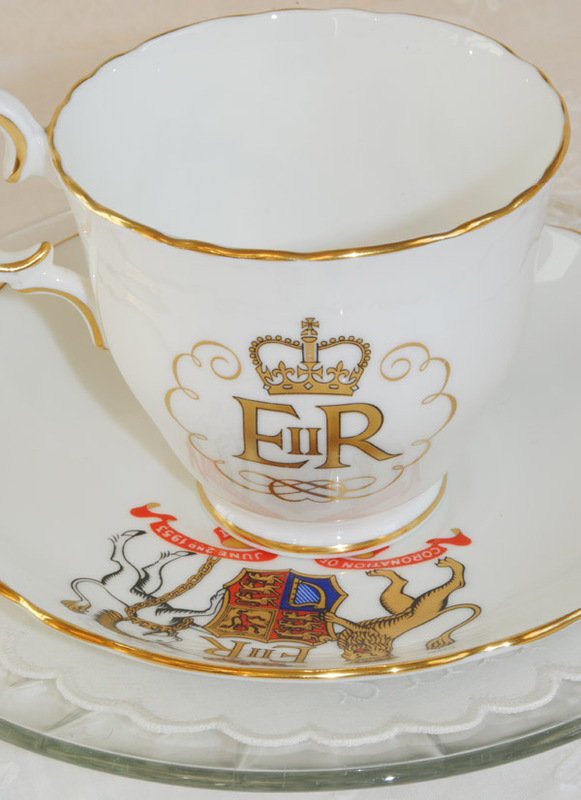 love your latest English Monarchy's teacups.. they are truly beautiful! Now you make me want to have one too! I have only the Queen Mother.. have a good week! 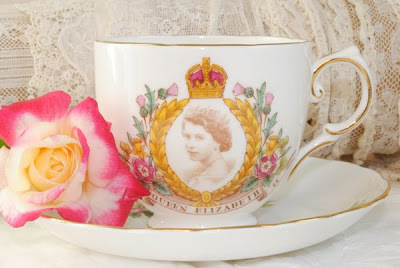 I do not know anything about this type of cup however I have an interest in the Queen and I really like the first cup. your a better person than me, I could never resist that cake, Yum it looks sooo good. gotta get busy trying to catch up. 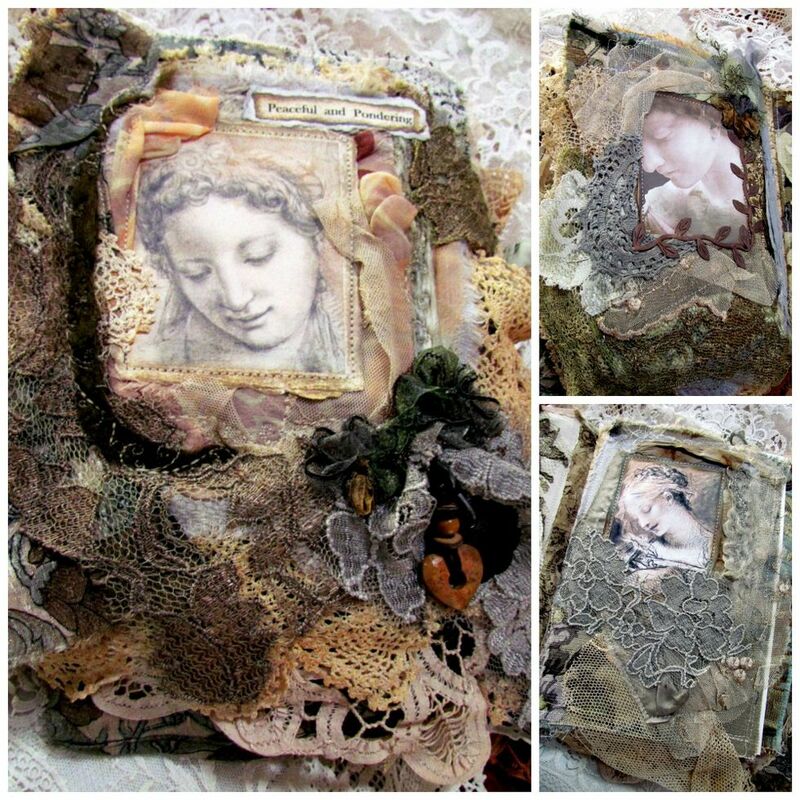 Terri...I absolutely adore these..gorgeous !! What a wonderful spotlight..yay! Happy tea!! Your trip to England sounds like lots of fun...and then to find another piece for your new collection right in your own backyard is just like it was meant to find you. 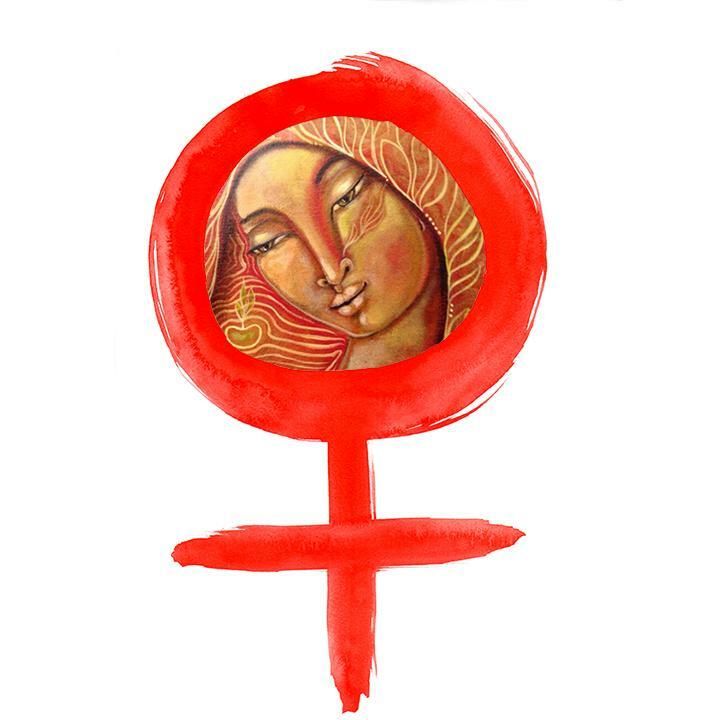 Thank you for hosting, I am so excited to join you ladies this week. Queen Elizabeth was here in Canada not that long ago. My mother simply adores her! The Queen's last name I believe is Windsor. There is quite a history behind her name. 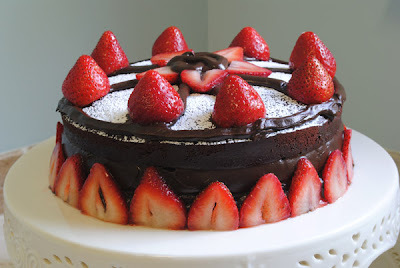 Your cake looks delicious and very fattening! Thanks for having us for tea. 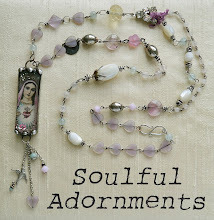 These are beautiful and I imagine very, very difficult to find! 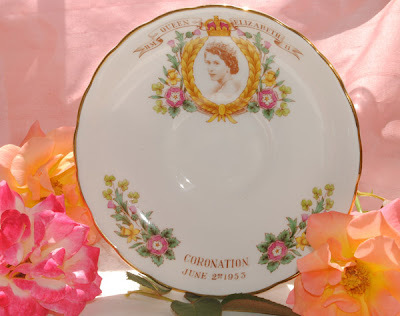 Your coronation´s Queen Elisabeth cups are really pretty,your collection is fantastic! I have a mug too about her Silver Jubilee,I bought it in Portobello market in London and I love it. Wishing you a lovely Tea tuesday!! Terri you have started a wonderful collection. I love the first one. The Queen looks very beautiful. The cake looks so amazing my blood sugar is going up just looking at it. LOL have a wonderful day! Hi Terri being in England I new the R was for Ragina forgoat the translation though ha ha so basically it means queen yay! beautiful cups I have seen a few of these in charty shops in UK but never had any interest although I do love hiistory so if see a corination one I will be sure to pick one up we have lots of Diana & Charles stuff too if I see a marage one I will buy that too lol so thank you for the historical nudge I should be proud of our royal family however when you see what they get upto half the time I do wonder why it is we have them if they can't even be a good example? I collect coronation bits and pieces too. I think yours were probably made the year of the coronation-it is a very popular souvenir item. When we were there at the time of Prince Andrew's wedding, even the milk bottles that were delivered that day had "royal wedding" caps! (I wish I had saved one). Someone mentioned the Queen's last name. They took the family name "Windsor" when she married Philip, as it was inappropiate for her to take her husband's name. They are Known as the "House of Windsor", but the primary royals do not use a last name. Hi Hun - you would have a ball in the shops here in the UK. WE have many second hand shops in the village next to where I live. I actually feel like going hunting for a cup and saucer for you. I Absolutely LOVE your Queen cups!!! 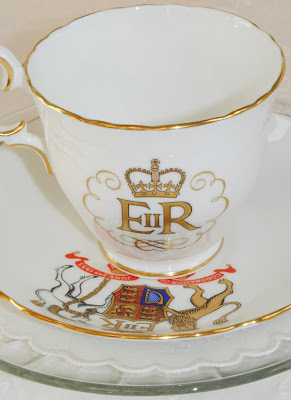 I have a very small, but growing QEII collection... And I have my eye on some queen teacups on e-bay. Stop by sometime. 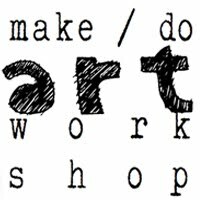 I'm having a giveaway. 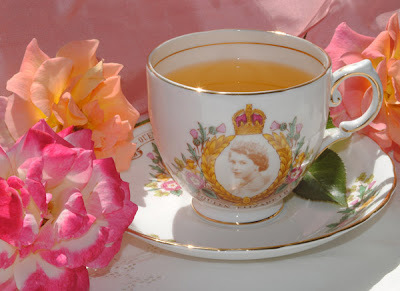 Terri, I adore your tea cup with the photo of Queen Elizabeth. It's fabulous! The cake is really beautiful, too. You have a talented cook in the family! I've missed you, Terri. I missed Teacup Tuesday last week...and it seems that I didn't even visit all my favorite blogs, because I KNOW I didn't see your chintz. I will have to read that post after leaving this comment. Your commemorative teacups are lovely. It would be fabulous to have the entire collection. I do not know what the "R" is for. From studying English history with my kids (since I homeschooled them), I know that the British crown was from the Hanover line for most of the 1700's and the 1800's, after which it became Saxe-Coburg. I think it was that name that was changed to Windsor in 1917. Although I'm American, my family ancestors are British, so it's always been fun studying British history. It would be equally fun having your lovely teacup collection. Oh, and that cake... WOW!! The girls did an amazing job. It looks delish!! What lovely tea cups in honor of Queen Elizabeth! So very stunning and regal!! I really enjoyed seeing them. Thanks so much for sharing them with all of us today!! I cannot stop thinking about having some of the cake...it is gorgeous and I'm sure tasted as good as it looked! Oh Honey! Your queenie teacups are regal!! I adore them!! The cake looks soo yummy, too!! Why didn't you have a teeny bite?? Terri, this cup is beautiful. All of your cups are beautiful. I love the story of how you found this treasure. How in the world did you pass on the yummy cake? I think I need your will power. Tea with the queen...realy cool! Wonderful cups as always, Terri! This cake looks so YUMMY...my mouth is watering. Have a wonderful upcoming wekend! 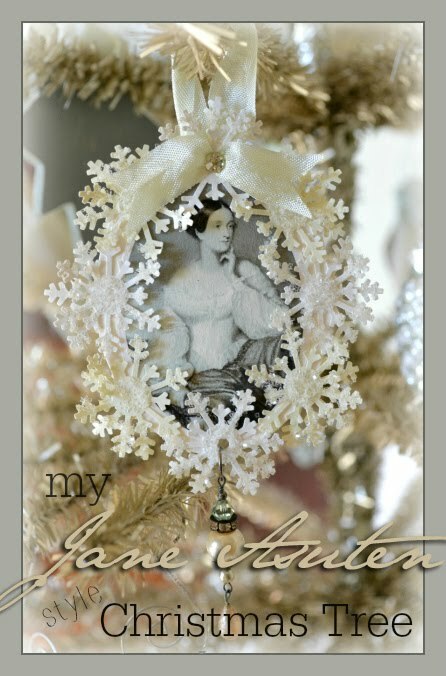 Check out my Blog, when you have a sec..
Ahhh the chintz, the chintz, adore the chintz! Silly, that is me, sorry for the gushing but sooo lovely. I had forgotten how much I loved it! My aunt had a teapot of it and it made me feel sunny! I wonder whatever happened to it? Thanks dear wonderful gal for the beauty. Take care and blessings. I know it's been a while, but I'm back visiting everyone again and have finally posted, so please stop for a visit. 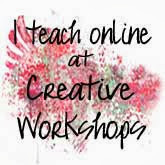 I love visiting your blog, you have a wonderful collection of teacups to share. These seem exceptionally special since they are coronation items. How lucky you are to have them in your collection! By the way, that gorgeous cake just made my mouth water. That is a lovely tea cup Missy - and I love it. Yes, it is Regina the R .... I read some of the other comments. I've missed us getting together - seems both our lives are a little busy. Also love your second tea cup you found. I loved London when I was there a number of years ago. 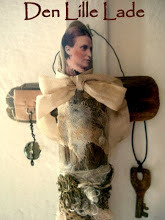 Yes, my dear one, your blog is loverly! Hugs!